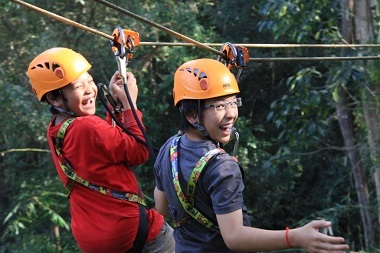 Save $10 on your once in lifetime opportunity to experience a world-class zipline inside the UNESCO World Heritage designated Angkor Archaeological Park. Select an Early Bird Pick Up between 6:30 and 7:15 AM and fly for only $89. That’s 2 to 2.5 hours in the ancient jungle’s of Cambodia enjoying a safe, educational adrenaline rush for the whole family. The entire adventure, from start to finish, is approximately 5-6 hrs depending on group size. Kids’ under 12 can also Save An Additonal $10 off this Tour. That’s only $79 for each child! Try an Eary Morning Pick Up - Save 10% Per Adult and $20 Per Child! 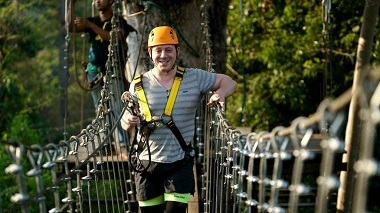 All the same great features of our Gold Zipline Tour but $10 off if you book your pick up between 6:30 and 7:15A any day. Surrounded by wildlife, butterflies, flowers, fauna and towering trees, two of our certified Sky Rangers will lead you and your group of no more than 9 guests on a safe journey. We promise you a rainforest eco-adventure you will never forget.